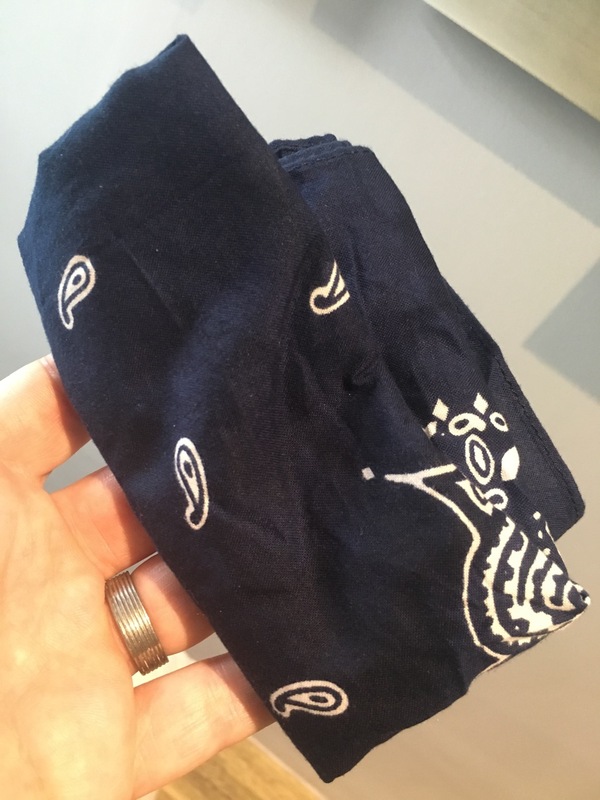 When I was packing all the stuff I thought would be necessary for a six-month journey around Oceania and parts of Asia, I was on the fence about whether or not to pack a handkerchief. But I thought to myself about how little space and weight it takes up, and decided to take a chance that it would be useful. Good decision. This hanky (a “square piece of cloth or paper used for cleaning the nose and drying the eyes”) has come in handy for many uses in many countries. Over the course of the past five months, I’ve had a common cold a couple times, and it has been useful then for the intended purpose – cleaning the nose. That’s especially important because of the difficulty I’ve had finding cold medicines that dry up post-nasal drip, something I take for granted in the USA. But I’ve used it way, way more to wipe sweat off my face since we’ve spent so much time in the tropics. I had hoped that being in warm countries so much during our travels would toughen me up a bit to warm, humid weather. Back home, I’m a wimp. Even though I lived the first few years of my life in Texas (Beaumont and Houston), I don’t remember the heat and humidity being an issue. I guess when you’re four years old, you just don’t think about those things. But I’ve been in Wyoming and Colorado since the mid-70s, and it just doesn’t get hot and humid that much. Sure, some parts of the American west are hot during the summer, but definitely not during the winter. Tropical southeast Asia is hot (by my standards) even in the winter time. And as anyone from a sweaty climate will remind you, “it’s not so much the heat as the humidity.” Am I more acclimatized to heat and humidity than I was six months ago? It doesn’t feel like it. My hanky has also been very useful in cleaning off dirty and foggy windows in Indian trains and Indonesian planes. And wiping up spills or marks left by sweating drinks on furniture. I read an article before we set out from Denver about what one traveler (who calls himself the Expert Vagabond) considers so important that he takes his wherever he goes. It’s called a shemagh, or keffiyeh. I didn’t have a way to get one of those on short notice before leaving America, nor did I think it was all that important. But if I could, I’d go back in time and get one of those instead. Why? Well, it does everything a traditional handkerchief does, PLUS it’s much bigger – big enough to double over as an eye mask. On the long flight from LAX to Sydney, one of the many reasons I couldn’t sleep was that the cabin was always too bright. If I’d had a sleep mask, it would help. But I didn’t, and my American hanky was too small to make a difference. By the way, it’s not just Expert Vagabond and desert military men who recognize the value of something like a big scarf. If you’ve read Douglas Adams, you know that the “Hitchiker’s Guide to the Galaxy” says the single most important thing to take as you travel is a towel, for many of the same reasons that a shemagh are handy in the real world. I’m pretty sure if Ford Prefect had known better, he would’ve taken a shemagh instead of a towel. They’re lighter. I didn’t think about the shemagh much more for a couple months, but then when we visited Cambodia, I learned about a garment they have called a “krama“. It’s essentially the same thing, with just a different name. I really wanted to get one of those, but due to circumstances I never had time to shop. So I filed it in the back of my mind. The krama is apparently really versatile, as shown by this Tumblr blog, 101 Uses for a Krama. A month later, when we were in Rajasthan province in India, I saw a lot of men, particularly auto-rickshaw (“tuktuk”) drivers, who had a scarf they would use for warmth. Theirs looked to be made from a soft but thin wool. I remember one driver who had his scarf tucked up into the awning over his head during the day, and then when it got cold at night or in the morning, he could just pull it down and wrap it around his head as a scarf or hat or turban. I really wanted one like that, but I never found one that I thought was authentic and reasonably priced. So eventually I bought a cotton scarf. It was hand made in a village in Rajasthan, but only looks marginally manly. The ones I’d seen in Cambodia and on the tuktuk drivers of Rajasthan had a very masculine look to them, I thought. As I write this, I’m in Thailand in the dead of winter, where it’s hot and humid, at least by my standards. So getting a warm scarf is about the last thing on my mind. But next week I’ll be back in Denver, where I anticipate it’s going to be freaking cold. I’ll whip out my “marginally manly” scarf and see if it helps, but I’m a little skeptical.